Google services are very popular in many countries around the world, such as United States, United Kingdom, New Zealand and Australia etc. Google browser, search engine, email and other services are widely used. However, Google has been blocked in some countries and areas. People in China, Iran, and Congo can’t use google search engine, thus they are not able to access useful search results. People who use Gmail in their countries can’t check Gmail when traveling in those countries. That is very inconvenient. Hence, a useful VPN is needed to unblock Google. With a VPN, you can bypass the national firewall and use Google services freely no matter where you are. A VPN is a virtual private network that basically reroutes all of your traffic via a secure tunnel and encrypts it along the way. By doing so, you are able to unblock Google Search and all other banned sites in China as long as you are connected to the VPN server. Others and the firewall will not be able to detect and spy on your online activities in this case. In Which Countries Google is Blocked and Why? Governments of some countries block Google for different reasons. In China, the government blocks Google to control the flow of information, not allowing them to view some, videos and articles etc. Google has been blocked in Ethiopia to avoid university exam leakage. Pakistan banned Google because an anti-Islam film that was not taken down by Google. In Iran, Google has been banned since 2009. Google services have been banned in Congo since 19 October 2015. They blocked Google services for political reasons. Of course, there are much more similar countries and regions. In other words, people in those places can’t use Google services in a traditional way no matter you are a foreigner or local people there. Therefor, you need a VPN to unblock Google if would like to use Google search engine, Google Play Store, Gmail and other popular and useful services. Why You Need to Unblock Google with a VPN for Its Services? As we all know, Google ranks search results based on the authenticity and practicability. At the same time, many search engines rank results according to the advertisement fee. Therefore, not all of the search results are reliable. Some of the results even have nothing to do with what you want. Instead, they only are ads. If you need exact and reliable information on the Internet, it is wise to use Google search engine. A VPN not only helps you bypass the firewall, it also speeds up your Internet connection while visiting websites supported by Google. When using an IP of VPN service, you are just like a local user on Google. Your network will be very fast. How to unblock Google with a VPN? First of all, you need to find out a reliable VPN server and sign up a plan. Next, you have to set up VPN on your device and connect your device to the VPN server. Before you purchase a VPN, you ought to figure to which one is reliable and what kind of VPN you need. Remember that you need a suitable VPN to unblock Google. Once you get a good VPN, you should learn how to make it work. Some VPN servers provide guides about how to use VPN on different devices while some do not. Therefore, you can setup the VPN connection step by step by yourself on your device by following the provided setup guides. Or, you can download and install a VPN app off the Internet on your device instead. VPN apps are available on PC, Mac, iPhone, iPad, and Android mobile devices. After you run the VPN app, you need to choose the VPN server you would like to connect to. Once the VPN connection is established, all your traffic is encrypted. Also, your IP address is hidden and you are an anonymity on Google with a VPN. In this way, you will be able to access all banned sites in your countries including Google Search, Bloger, Twitter, Instagram, and Facebook. 1. Select the dedicated and optimized one for China. 2. Stealth Servers near China like in Hong Kong, Singapore, Japan etc. should be your first choice. It will bring you less latency and better connection performance. 3. It must be a reliable VPN, because fighting GFW is not easy and many VPN services give up. Do not purchase one just because it is cheap. Otherwise, you will lose more. Besides, no free VPN service or other free tools are stable. Too many limits will help you a lot. One day they might work and the other day you don’t get the access because they get blocked by GFW. 4. Pre-buying research is very necessary. If you bought one in a rush, you would meet many problems and find that it is not what you want. How VPN works while you are trying to access a website? In order to let you know the functions of VPN, let’s talk about how it works in detail. You run VPN and click on link you want to visit. The browser sends encrypted your account & password and request to your VPN service first. Then, VPN service decrypts the communication and sends it to the targeted website. After the website receives data, it generates session cookie and send it to your VPN service. VPN encrypts the session data it received and then sends it back to your device. In this way, you can view the website you like after your browser received the session cookie. You may think that the process is too complicated and it will take a long time before you can access the targeted website. In fact, everything we mentioned above happens at an amazing and unbelievable speed. In the blink of an eye your request will be sent and everything will respond. Your Internet connection is secure, encrypted and extremely fast with VPN service. Problem 1: I can connection VPN service via 4G mobile data on my phone, but I can’t connect it via WiFi hotspot? I saw WIFi signal bar there while it still used my mobile data. The problem may be that WiFi hotspot sets limits on VPN connection. NAT of VPN, namely PPTP/L2TP has been limited. WiFi hotspot refuses to transfer your data to the VPN service. Problem 2: I failed to visit some regular websites after I turned off VPN. I could access those websites before I first used VPN. I am a Chinese user and I use VPN service to access Facebook, Twitter and watch Youtube. Now, I can’t visit my favorite Chinese websites in a normal way. I have to run VPN so that I can access them. Firstly, there may be something wrong with your routing tables. Check your default route and VPN gateway. Thirdly, it may be the mechanism network problem or Internet proxy. Check your Internet settings. Fourthly, it may be caused by non-normal exit. Next time, remember quit it in a normal way. Problem 3: I can’t access local area network after I connect to VPN. It may be caused by IP address conflict. Check your network line and correct the settings. Find your original gateway address via command. Problems 4: Why I have blue screen after I run VPN? Probably, your drive is not compatible with the VPN service you use. Besides, some anti-virus programs, game protection drive and bank security controls will bring blue screen when you use VPN. Google services are great enough and it is worth of using Google. Can’t access Google in the areas you are living or the place you travel to? Sign up a suitable VPN service and get a different IP to view Google sites and check Gmail whenever you want. Many things will be very convenient and easy with a VPN when browsing, working or traveling. It will not disappoint you. Just get a VPN to unblock Google and enjoy the benefit. 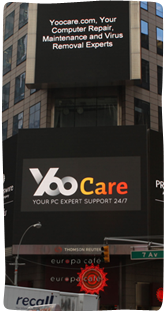 Kindly Reminder: If you have any question regarding how to Set up VPN on your device, please live chat with YooCare online expert for help.